There are many great home school books that can be used to build a terrific family library of quality homeschool resources for all grades. These can be easily found online and offline, too, at many new or used book stores. Several distributors for Usborne books have told me that they originally got started in their business because they loved the books so much. The company also regularly offers fantastic start-up deals for those interested in getting into this type of business. The majority of these books can easily be found at online sites, garage sales, and even at used home school curriculum sales and sometimes, as freebies at a table. Occasionally, I have even picked up homeschool used books at consignment sales, local thrift stores, and similar places where people sell used books and curriculum. Christian books for the whole family, entertaining, educational and enlightening! A few other useful books are those in the E.D. 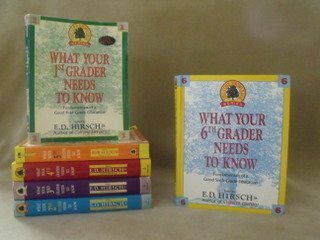 Hirsch series, Scholastic 100 Words to Read by ___ Grade, and the large, pictorial Life books found on many coffee tables. Most of the books I have listed cover all the basic subjects although some are geared toward a specific subject area, such as Bible. History and science topics are presented very nicely in these types of books and is usually done in a more enjoyable way than what is found in home school curriculums. Although not exactly curriculum items, these complementary homeschool books can make a vast contribution to your overall program. As we teach our children at home we should strive to surround them with as many quality materials as possible.